Laying in the grass with my dog is one of my most fondest and itchiest childhood memories. I remember being a little girl who loved to lay in the sun, gazing into my beloved golden retriever's eyes. We would lay there for what seemed like hours with our paws together stretched out on our sides. I wished so badly that we could have had a conversation together, but at the same time, I felt like she knew exactly what I was thinking and that I knew exactly what she was thinking- that life is very good laying in the sun together. Sarah and I were inseparable. Everywhere I went she was by my side like a little guardian angel. My best friend Stephanie and I would play all day outside, and we would have our dogs only a few yards away at all times. Whether they were snacking on avocados from the grove or digging in the dirt or sleeping in the shade, Duchess and Sarah always had one eye on us at all times. We would dress them up in cowgirl clothes, we would jump them over our homemade agility jumps, and we would go swimming in the creek. Our favorite thing to do was run full speed back and forth across Stephanie's field with the dogs racing to keep up with us. Our dogs lived freely on our family's little ranches and they never had any fences or leashes to keep them restricted. They lived naturally, doing what dogs do best, playing, sleeping, running, rolling, eating, running, exploring, running, walking, swimming, napping, loving and watching. Our dogs never had any "behavioral problems" because they were not confined and were able to be real live dogs. Sarah, Stephanie and Duchess, were my best friends and taught me so much about how to play, laugh and be free. The four of us were so happy running all day together and taking naps on the grass in the sun. We had so much fun together and enjoyed each other's company without any stresses, time constraints, worries or fears. Fast forward twenty years, and I'm still best friends with Stephanie, but now I have my own dogs, Daisy and Taj, who do not live quite as naturally as lucky Sarah did. Not to say that Daisy and Taj have bad doggy lives, in fact, they are very happy dogs who get to run and play off leash all the time at the beach, however, they live in a two bedroom apartment and don't have much of a yard to play in. That's why I take my dogs everywhere with me. They've been to the movie theaters, they've been to restaurants, coffee shops, Home Depot, bookstores, and anywhere else that I can get away with taking them in with me. They love car rides, they love any new place, and they love having their brains engaged. They are also highly street trained and can be off-leash pretty much anywhere (except for around squirrels at the Cove, that's asking a lot!). They have been socialized to death and I truly enjoy my dogs so much that I want them to go everywhere and anywhere with me. When they were puppies it took a lot time, training and patience to get them to the point where I trust them to go everywhere with me, but it's so worth it. It takes a lot more responsibility and time to create happy dogs when you don't live on a 5-acre ranch with no fences. The more training and effort that you put in to teaching your dog how to live in your 'human' life will allow your dog to have more freedom despite being more confined. For example, teaching your dog street smarts so that they don't go into the street until they are cued, is extremely important and necessary for any dog living in a city. Also, by trusting your dog around streets and by teaching your dog a reliable recall, you'll be more inclined to take your dog off-leash to really run and play. It's practically animal cruelty to never ever let your dog run off-leash and play. The reason why most dogs have behavioral problems in the first place is because of having too much pent up energy. Dogs naturally need to run, sniff, smell and be FREE. Besides, isn't the point of having a dog is have more fun out in the great outdoors? Living unnaturally, for dogs as well as humans, creates anxiety, destruction, hyperactivity, and much more. A vast majority of 'bad dogs' are just dogs in need of space, freedom, attention and more fun! 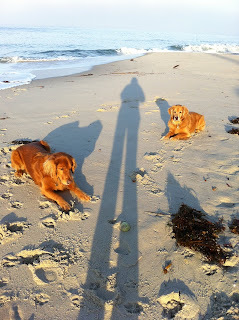 Going for a walk on the beach with my dogs is probably one of my most favorite things to do. 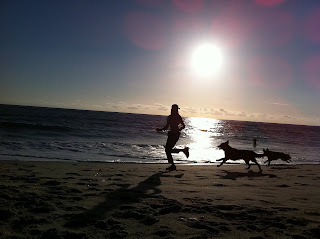 I love watching my dogs run huge circles all around me as they use their noses to track smells on the beach. I love watching them jump over the waves and crash into the water. I love watching them dig holes to China. I really love how my dogs remind me to have fun, play, and live in the moment. My dogs remind me to be free! To smell the ocean and to take a deep breath. Sometimes I'll run with my dogs as fast as I can pretending to be racing them like I did with Sarah, Duchess and Stephanie. And then I'll laugh and smile and enjoy every ounce of having fun with my dogs. In fact, I'm going to go take them to the beach right now. I feel like being happy with my dogs in this very moment.